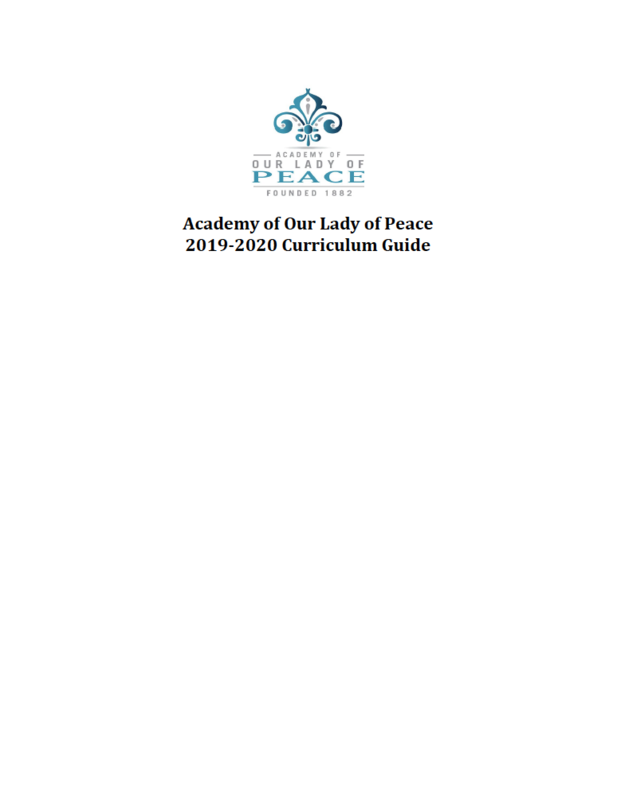 Welcome to the Curriculum Guide for the 2019-2020 school year at the Academy of Our Lady of Peace. We invite our families to carefully review this material and make selections that promise a successful year ahead as well as a happy one. This page is an abbreviated version of the 2019-2020 Curriculum Guide for easy reference accessible anywhere. The full 2019-2020 Curriculum Guide can be viewed and downloaded as a PDF here or in the sidebar. The registration window will open on January 23 and close on January 31. It is important that both students and parents carefully read the course descriptions and prerequisites. As a reminder, these are located on the OLP website (www.aolp.org) under the “Academics” tab. Students should discuss course choices with both their parents and counselor. Many courses have written prerequisites and students are expected to evaluate their eligibility for courses based on those requirements. Students will be required to take the courses for which they pre-register unless the student does not meet published prerequisites, the class is canceled, or an irresolvable conflict in scheduling exists. Students will participate in a workshop with their counselor to learn about the new course options on January 22, 2019. During this workshop, students will be provided with the Schedule Request Form and will be asked to indicate their 1st, 2nd, and 3rd choice course preferences. This form must be completed and signed by a parent affirming the course request preferences. Following the workshop, students will have until January 31st to submit their course registration requests via Blackbaud. Students will need to refer to the course descriptions, available on our website, in order to make their selections. The registration window will open on January 23 and close on January 31. Students will then meet individually with their counselor throughout the month of February to affirm and/or revise their course preferences. Counseling appointments will only be granted to students with completed and signed Schedule Request Forms who have also completed the online registration through Blackbaud. Counselors will email their individual students with instructions for scheduling appointments. Developing a class schedule for a student incorporates the student’s wishes, as indicated on her schedule request form, and the ability of the school to meet those requests and those of other students. If an irresolvable schedule conflict exists, courses may be substituted without student notification. Therefore, it is required that second and third alternate choices be selected with the same care as our first choices. If a student did not receive a first choice or alternate selection, or if there was an administrative error, a request for a schedule change may be submitted to the counselor without cost. Schedule changes for other reasons will be charged a $20 schedule fee and processed through the students FACTS account. Schedule changes will not be granted for teacher preference. Students will receive their schedules in May and will have an opportunity to request a meeting with their counselor to process a schedule change, if desired. ALL requests for changes must be finalized by the first three calendar days of instruction of each semester. After the first three days on instruction, students are no longer permitted to make schedule changes without penalty. Any student who requests dropping a course after the first three days of instruction and until the end of the first quarter will receive a “W” (withdrawal) on her transcript. Students are not eligible to withdraw from a course after the quarter. Similarly, students may wish to change their second semester course selections. The window for changing second semester schedules opens the first week of December and the same policies apply. Students will be charged a $20 schedule change fee and they must finalize the request by the first three calendar days of instruction. Changes made after this timeframe until the third quarter will also result in a “W” (withdrawal) on her transcript. Students are not eligible to withdraw from a course after the third quarter. Students are provided with many opportunities to plan their schedules carefully. Therefore, students are expected to make a commitment to each course for its duration. Changing one course in a student’s schedule most likely requires a change to the entire schedule. If students have questions about their selections or courses after the course change deadline has passed, they should see their counselor for assistance. To graduate from the Academy of Our Lady of Peace, a student must be enrolled on campus in a minimum of 6 courses each of the 8 semesters and complete a four-year program of studies earning a minimum of 240 units (1 semester = 5 units). A full breakdown can be found on the Course Profiles homepage. A balance of courses prepares students for a more diversified future and opens doors to various fields. On this page are the minimum high school courses required for eligibility to the University of California and California State University systems. It is the expectation that all students will satisfactorily pass every course with a grade of C or higher. In the instance where a student earns a D or F grade, the course must be repeated. Specifically, students earning D or F grades in a UC/CSU A-G courses must repeat or validate the course prior to senior year to maintain college eligibility. Similarly, any student earning an F grade must also repeat the course to maintain eligibility for high school graduation. Students who earn a semester D or F grade are encouraged to repeat such classes during the summer immediately following the school year in which the failure occurred. It is critical that students choose UC approved courses when repeating classes. There will be an indication of a student’s refreshed coursework and grade on her transcript. If you need assistance finding a course off-site, your daughter’s counselors is able to assist you. Please review the Student Handbook section on Academic Policies for updated policies and procedures. All courses at OLP are college preparatory in nature and, therefore, prepare students for the rigor of higher education. Some courses, however, are provided to allow students with a passion in particular disciplines to proceed at an accelerated pace and to actively participate in courses involving higher level thinking skills. OLP offers a wide variety of both Honors and Advanced Placement courses. Honors and Advanced Placement courses do carry an added 1.0 grade point as reflected on the student's OLP academic transcript. Please note that American Literature Honors carries an added .5 grade point. The Advanced Placement Program at OLP offers a college/university level curriculum for high school students, coordinated by College Board. An AP course at OLP will assess students by college/university level standards. It is expected that college/university level projects and activities that span a wide range of intellectual tasks will be assigned to the students. The Advanced Placement Program is established at the national level and administers national proficiency tests at the end of the second semester in May. Students enrolling in AP classes study a college-level curriculum using prescribed college texts, and have the option to take the AP exam at the close of the course. Students are strongly encouraged to take the AP Exam in May. Please note that the AP exam does have an additional test fee not included in tuition. Students and parents are encouraged to discuss co-curricular activities, outside-of-school work responsibilities, and additional in-school activities that will also require the student's time. All students interested in taking an AP level course must attend (or watch via livestream) the AP Information Night on January 23, 2019 at 6 pm. Note: To promote balance and health, students are counseled to limit their enrollment to three advanced (AP/Honor/Advanced) courses per semester. OLP offers a limited number of online courses designed to allow students to strengthen their academic preparation for college. The Pilot Online Academy courses mirror the same high quality academic structures and use the same curriculum as their traditional classroom counterparts, but offer a convenient and flexible format. These classes can be used to satisfy OLP academic graduation requirements and college entrance requirements while adding flexibility to the student’s schedule and providing a supportive online experience. Please be aware that the rigor of an online course will match that of an OLP on-campus course. Students who are signing up to take online courses will be held to the policies and standards as relayed in the OLP Student/Parent Handbook. Online students must be self-starters. Participating in online coursework requires maturity and motivation to work independently. Online courses require students to use their time wisely, be organized, be self-directed, and be willing to try new modes of communication and learning. Although online learning is commonly used in high schools, colleges, and work environments, it is challenging and requires certain individual characteristics in order to experience success. We require a Parental Consent Form (available on page 9) to be completed prior to enrolling in the course because students will be held to the same withdraw (W) policy as the traditional in-classroom course offerings. Online course work is recorded as part of a student’s transcript. As students and parents begin preliminary course selection planning, it is important to consider a “zero block”. The primary purpose of zero block is to offer students greater access to broader course selections. More specifically, zero block frees up space in a student’s schedule by giving her an additional period in her academic rotation in order to take more electives in a subject of interest or to move more quickly into advanced courses. Zero block meets from 6:45 am – 7:35 am (Mon. – Thurs.) and therefore necessitates a firm commitment on the part of participating students. During G Block, students can choose to take an academic course. Those who don’t select an academic course will be placed in a quiet study hall. The study hall class is designed to give students a place to work in a quiet atmosphere during the school day. Students are required to come to study hall with work to be completed. Study Hall is a non credit bearing course; no letter grade or credit will be given. Students can enroll in up to 7 courses per semester with no additional fees. Students who choose to enroll in an 8th course will be charged a $450 fee. Additionally, any student who requests dropping an 8th course after March 20, 2019 will still be charged a $450 fee per semester course in the 2019-2020 billing cycle (no refunds will be issued). We staff these courses according to enrollment prior to April 1, 2019. All students must complete 85 hours of service. A minimum of 25 hours of service must be completed each of the freshmen, sophomore and junior years. Senior year students are required to complete a total of 10 hours by the end of January their senior year. Please read over the specific terms and conditions listed in the Student Handbook under Academic Policies section D-Christian Service Learning Program. OLP strives to develop mastery of 21st-century skills in each student to ensure that she becomes an engaged agent of change in our global society. Technology plays a critical role in the way we collaborate and communicate in that same world. With respect to OLP’s mission and the economic diversity of our families, OLP is not mandating the specific device each student uses, but rather, has adopted a “Bring Your Own Device” (BYOD) policy that outlines minimum specifications for whatever device a family chooses. This policy and practice will guide the use of interactive instruction and learning that will connect our students more meaningfully to the world outside. For more information about our BYOD policy, please visit the STEM section of our school’s website. The school prioritizes offering an ebook option whenever possible in order to ease the burden of costs for textbooks, shipping issues, and stock issues. Most rental dates for e-books are six months or one year. Please be cognizant of rental periods before purchasing an ebook rental. The finalized book list will be published on the school’s website in June under the Academics tab. OLP is not liable for refunds on ebook purchases that are rented prior to the time period allotted for the course. Students may have the option to buy a paper textbook through any vendor. We suggest you use the vendor that offers the best deal in the best interest of your family. For further questions, contact the Assistant Principal of Curriculum and Instruction. The PDF version of this curriculum guide offers a sample academic plan, worksheets to help you plan, the full 2019-20 list of courses in a table format, and the 2019-20 Course Registration Form that you will turn into your counselor. Parents must sign off on the Course Registration Form.